According to the makers of Boomerang mail plug-in, one of the best way in getting a reply to unanswered emails is to write as if you are a nine years old. As per their observation, writing at a third grade reading level is considered to be the right level of complexity for the average message after mining the data of the user for information on what type of writing would normally get replies. It is worth considering taking extra time to think why one would want to write like a nine year old. Emails tend to get a bad knock these days and are often considered to be inefficient. Viewing most of the email writing styles from Boomerang, the main thing of making messages seem better,are to keep the focus on ease. In order to get replies, the company recommends the use of shorter, simpler stretches and hence the third grading reading level could be helpful. Writing them this way would normally acquire a response rate of 53% as against the 45% for the messages written at a high school reading level. Simple writing too could reduce the chances of a reply. 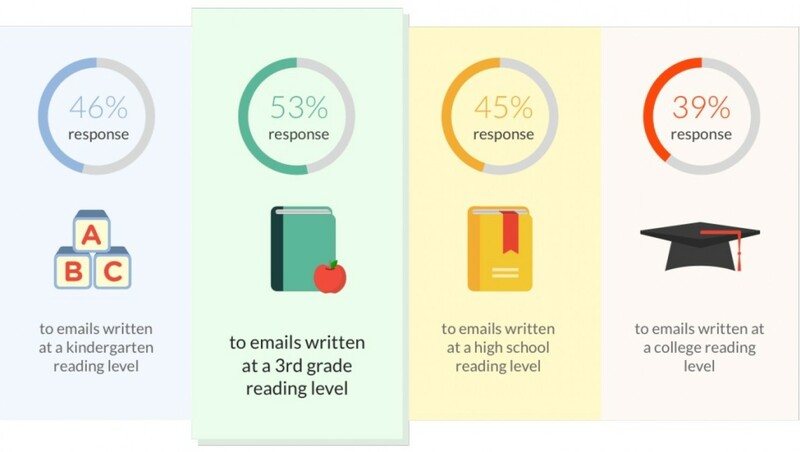 Messages written at a kindergarten reading level would receive replies only at 46% of the time. However the poorest response rate would be for those writing at a college reading level at 39%. The company also observed that being a bit more expressive is the best option of getting responses. With an opinion and adding some emotional tone either positive or negative could also get a better result instead of being totally neutral. It also depends on how much one should say, to get too rambling would not get you the response one would be waiting to receive. On the other hand if one is too brief, you could get a low response rate. If the email recipient would need extra information in making a decision or to understand the email’s subject, provide the necessary information as an attachment or a link. The reason for writing an email to a person is with the purpose of receiving a response from them, however too often than not, some of the emails tend to be overlooked or forgotten since they could be too long, too brief, too complex or do not provide adequate information.